Some Pig. Humble. Radiant. These are the words in Charlotte's Web, high up in Zuckerman's barn. Charlotte's spiderweb tells of her fe This beloved book by E. B. White, author of Stuart Little and The Trumpet of the Swan, is a classic of children's literature that is "just about perfect." This high-quality paperback features vibrant illustrations colorized by Rosemary Wells! To ask other readers questions about Charlotte's Web, please sign up. what would you recommend as a similar good read? Caitlyn I'd recommend The Trumpet of the Swan, also by E.B. White. It also includes animals, to be specific, swans. Charlotte is everyone's mother. She's everyone's teacher. She's everyone's friend. As Pollyanna as it will sound, we should all have a Charlotte in our life to help us grow up and mature into terrific, radiant and humble human beings. (I'll avoid calling us "some pig" as the other message she crafts). All the lessons children can learn from this book are important, even the ones about death. I won't spoil it, but despite all the efforts across all the animals and the people in this treasure, someone doesn't make it. It's on the same level as "Bambi" in my opinion when it comes to a must-read for children, even if the harsh realities of life are exposed. 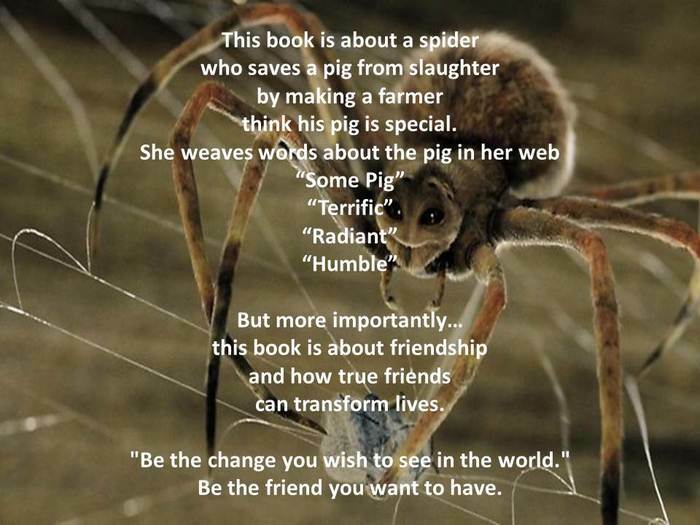 One of the great tear-jerkers of my long-lost childhood, the unlikely friendship between a spider and a pig makes for wonderful reading and a shared moment of love when reading it to kids. It is tender and teaches the values of constancy and integrity in a light, beautiful prose. A classic and a masterpiece. Charlotte’s Web is one of my favorite childhood books. I watched it so many times and never got bored with it. A little pig who wants to see the first show and who wants to live instead of becoming sausages. This little story has many important feelings and lesson. It teaches us to respect other living creatures and how to live side by side in peace. It told about humility and explained how important it is to have a great friendship. A friend who does anything to saved her little buddy’s life. A friend who once made a promise and now she will go through fire and water to keep her word. I’ve become such a sensitive little girl if the story is about an animal’s death. I’m feeling sorry about all of them. In my world, I think they have soul and they are sentinent beings. This book is an amazing classic, and it made me emotional. Haha. I gave it 5 stars because it is perfect for me. It has a much valuable lesson and I really appreciate it. I recommend it to everyone who hasn’t read it. Wait a second! Why don’t you read it yet? Go to the library, NOW! 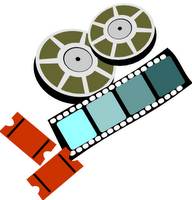 Or watch the movie I recommend it too. Barbie leslie hamod wrote: "Beautiful Barbie!🌹"
'pologies to anybody following my reviews in hope of insights into epic fantasy novels - I get through more kids' stuff reading to my little girl (who is too disabled to do it for herself). Charlotte's Web is a book I've been aware of for nearly 40 years but somehow managed to avoid reading when I was little. We picked it up at the hospice last week and read the first half, then had to buy a copy at Waterstones yesterday to finish it off (59 years in print and it's still selling for £6.99 in pap 'pologies to anybody following my reviews in hope of insights into epic fantasy novels - I get through more kids' stuff reading to my little girl (who is too disabled to do it for herself). The book's a classic for good reason. It delivers an emotional but refreshingly unsentimental story with twists and turns, and inadvertantly lets us have a look at rural American life in the late 1940's. In addition to a strong and engaging story E.B White has powerful prose that doesn't confuse a child, but carries more weight than you're likely to see in most children's stories. My 8 years old self would have loved this book, I had been looking for an excuse to read this book for years and just realised on seeing it this week in a book shop that I didn't need an excuse to read it, I can just pick it up and indulge myself in little animal behaviour and so I enjoyed this beautiful story of a livestock pig named Wilbur and his friendship with a barn spider named Charlotte. This book is so beautifully written and the illustrations in the copy I have just made it that much My 8 years old self would have loved this book, I had been looking for an excuse to read this book for years and just realised on seeing it this week in a book shop that I didn't need an excuse to read it, I can just pick it up and indulge myself in little animal behaviour and so I enjoyed this beautiful story of a livestock pig named Wilbur and his friendship with a barn spider named Charlotte. This book is so beautifully written and the illustrations in the copy I have just made it that much better. Friendship and love are the central themes of Charlotte's Web, This is a terrific children's book which I think many adults like myself will appreciate the story as well and I am going to hold on to this copy as I hope if the future (long distant future) to take it out again and perhaps read to my grand children. ". . . this lovely world, these precious days . . ."
I always get in the mood for this book when county fair season rolls around. Ah, the midway with it's dizzying rides and scary carny folk. The agriculture buildings featuring prize-winning giant produce and lovingly crafted quilts. And the yummy scents of frying dough competing with the much earthier smells emanating from the livestock tents. It smelled of hay and it smelled of manure. It smelled of the perspiration of tired h ". . . this lovely world, these precious days . . ."
It smelled of hay and it smelled of manure. It smelled of the perspiration of tired horses and the wonderful sweet breath of patient cows. It often had a sort of peaceful smell - as though nothing bad could ever happen again in the world. I always pay a visit to the cows, sheep and pigs temporarily housed there, and try not to think about how many of them are doomed, already auctioned off to local restaurants. With that sad fact in mind, is it any wonder how this fanciful tale can grip the imagination and tug at the heart . 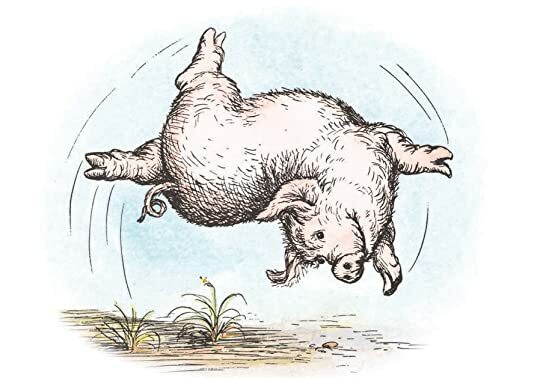 . . the story of Zuckerman's Famous Pig - Wilbur, the Pig Who Lived! The book begins with our hero narrowly avoiding the ax, saved from death by a young girl who promises to raise him. He grows and thrives under her care, but soon he's sentenced to a lonely life in a pen at her uncle's farm. But fret not, for he soon meets Charlotte, a large grey spider with an impeccable vocabulary. It is truly the beginning of a beautiful and unforgettable friendship. I know this is a childhood favorite for many readers, but I was introduced to these characters not through the book, but by the 1973 animated film. 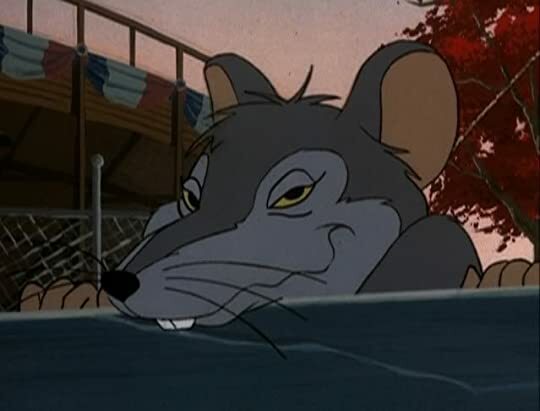 Because of this, I will always associate Paul Lynde's memorably snarky voice with Templeton the rat. "What's in it for meeee?" I should be ashamed to admit that I didn't read the book until 2011, but I'm not. I think I appreciated it more fully as an aging adult than I would have as a kid. Having lost some friends and both parents, I know how fleeting life can be and how important it is to grab onto every last experience and memory. How strange that it is the wisdom of a spider that reminds us of what matters most in our lives. No pig ever had truer friends, and he realized that friendship is one of the most satisfying things in the world. Adding to the joy of the book are the sweet illustrations by Garth Williams. Happy to see there's a book out there not representing spiders as being dreadful creatures. Super sweet story. I have been familiar with the story for most of my life, but never read it until now. Wilbur the pig is born a runt, and the farmer decides he must face the axe. Kind-hearted little Fern intercedes and saves him. She cares for the undersized pig, who later goes to a nearby farm. Wilbur's life is nearly idyllic until he discovers the fate that has been woven for him: he will likely be the next Christmas ham. Horrified, he looks desperately for a door of escape. His pleas for help are overhead by a I have been familiar with the story for most of my life, but never read it until now. Wilbur the pig is born a runt, and the farmer decides he must face the axe. Kind-hearted little Fern intercedes and saves him. She cares for the undersized pig, who later goes to a nearby farm. Wilbur's life is nearly idyllic until he discovers the fate that has been woven for him: he will likely be the next Christmas ham. Horrified, he looks desperately for a door of escape. His pleas for help are overhead by a large grey spider who is almost invisible in the doorway. She decides to try to alter the thread by which his destiny is hanging, but will she succeed? Wilbur is some pig who is Radiant and humble. On the top of that, he could do a mean back flip like the Karate Kid. But would you believe me if I said that this radiant pig was almost killed..... twice? This is Wilbur's remarkable journey from almost being bacon to a beacon in the community! But this is not just his Journey. It's about Fern, the little girl who saved Wilbur's life when he was just a runt, and it's about Charlotte, a smart and sweet spider who befriends Wilbur. It's a great Children's book. If I were a kid, I would've loved it even more. And as an adult, (well, an almost adult) I loved the descriptions on summer (It was almost as if I could feel my childhood!) and Charlotte's protective instincts towards Wilbur. I was not quite sure about parts focusing on Fern. They seemed a bit off towards the end. Oddly enough, Charlotte also reminded me of the characters from Hidden Figures: The American Dream and the Untold Story of the Black Women Mathematicians Who Helped Win the Space Race. Well, food for thought. 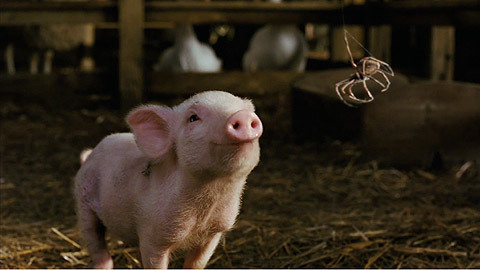 In the end, Charlotte's Web is a story about kindness and love. It's about reaffirming faith in a person's personality and values rather than appearances. And above all, It's about the value of friendship. Update 6/2018: I will boldly assert here that I think this is the greatest children's book ever written, and I am embarking today on my 4th read of this classic. It is my youngest child's turn to discover the joys and sorrows of friendship and of life, as presented by one of my favorite writers, Mr. E. B. White. Rest in peace, Andy, you beautiful man. This is quite ridiculous, that I should read this, at 42-years-old, for the third time in my life, and end up blubbering hot tears Update 6/2018: I will boldly assert here that I think this is the greatest children's book ever written, and I am embarking today on my 4th read of this classic. It is my youngest child's turn to discover the joys and sorrows of friendship and of life, as presented by one of my favorite writers, Mr. E. B. White. Rest in peace, Andy, you beautiful man. This is quite ridiculous, that I should read this, at 42-years-old, for the third time in my life, and end up blubbering hot tears all over my face and down the front of my shirt. I can't get over that my youngest, at 5-years-old, sat through the entire book this week, mesmerized by the brilliant and timeless story-telling. She giggled, frequently, at the funny passages, and then she laughed at me, her grown mother, crying a river for the last 40 pages. I honestly cried to the point of being physically incapable of reading out loud. And then, as Charlotte's babies drifted away shouting "Good-bye! Good-bye! Good-bye!" my daughter's face contorted strangely and the next thing I knew, she was face down on the floor, sobbing uncontrollably. I grew up without reading this book. For some, that seems to be unimaginable. I can maybe understand why. My wife and I are reading it now, or I should say, I am reading it aloud before bed, and it's really wonderful. I could totally see why it would be a kind of life-formative book. I was reading a passage last night and laughing at it (there is so much in here that is really funny), and it made me wonder about the level of the humor. That is, would the kid me have thought this was funny or is I grew up without reading this book. For some, that seems to be unimaginable. I can maybe understand why. My wife and I are reading it now, or I should say, I am reading it aloud before bed, and it's really wonderful. I could totally see why it would be a kind of life-formative book. I was reading a passage last night and laughing at it (there is so much in here that is really funny), and it made me wonder about the level of the humor. That is, would the kid me have thought this was funny or is it my adult self? And I think probably the kid would have. This is all to say that reading it now, as an adult, it gives me an appreciation for kids' minds, and kids' books that take them seriously, even in their humor. I hope that all makes sense. 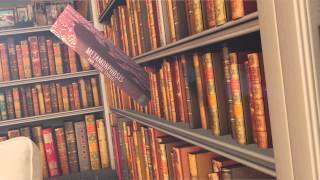 I'm a late comer to the Harry Potter books, too, but was really delighted by them in some of the same ways. But--to get back to "Charlotte's Web"--there's a section about the end of summer, a couple chapters away from their Fair trip. White makes this lovely kind of song about the end of the season and the coming of Fall and the kind of beauty and dread and tinged sadness of it all. My god, it was affecting. That's something that I probably would not have picked up on as a kid, but I think that has more to do with kid-me than with most kids. I know my wife remembered that part distinctly, in fact it is one of the reasons we went back to this book now. We have recently moved from Minnesota, our home for about four years, and Fair Time there just passed. We really experienced the sort of sad beauty of summer's end there. In our new place in Chapel Hill it hasn't happened quite yet. It is still hot and very dry from drought, so I don't know if there will be that kind of fading moment or not. We'll have to see. One of my favorite childhood memories is of reading this book with my mother. I remember how much I giggled at some of the funny situations and cried especially when we read it the first few times. Sobbing into my pillow with my mom rubbing my back I wondered why Charlotte had to die. My mom patiently explaining the gift Charlotte left for Wilbur. Even now I feel a bit of a lump in my throat. It was treasures like this that started my love of books and reading. I loved it so much I don't know ho One of my favorite childhood memories is of reading this book with my mother. I remember how much I giggled at some of the funny situations and cried especially when we read it the first few times. Sobbing into my pillow with my mom rubbing my back I wondered why Charlotte had to die. My mom patiently explaining the gift Charlotte left for Wilbur. Even now I feel a bit of a lump in my throat. It was treasures like this that started my love of books and reading. It was all in there! The meaning of true friendship, love, life's adventures, miracles, death, trust, betrayal, sorrow and the passing of time. Enjoyable to both children and adults I hope everyone reads this book at least once in their lives. Truly a timeless classic. As I now join the million's of readers who have enjoyed this great book, I realize it truly is a book for ALL ages. Loved every minute of it! But I really do love this book. Charlotte A. Cavatica, you will live on my heart forever. 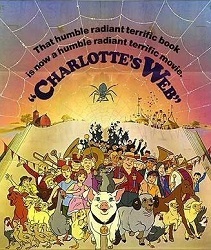 I have been listening to or reading Charlotte's Web since 1983. My first grade teacher, Mrs. Bunting, read this magical book to our class, and I can vividly remember sitting on my carpet square, entranced. Her reading that book to our class was the highlight of each day. Later that year, there was a movie in the theaters, and we went to see it as a class field trip. From my memory, everyone in class was excited about the book and the movie. 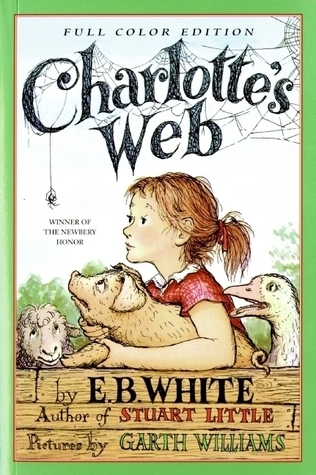 This was book was that important in the lives of early I have been listening to or reading Charlotte's Web since 1983. My first grade teacher, Mrs. Bunting, read this magical book to our class, and I can vividly remember sitting on my carpet square, entranced. Her reading that book to our class was the highlight of each day. Later that year, there was a movie in the theaters, and we went to see it as a class field trip. From my memory, everyone in class was excited about the book and the movie. This was book was that important in the lives of early readers. I also remember the book fair that school year, and my mom allowed me to buy one book (and bookmark- these were the days of unicorns and rainbows, and my first bookmark had both. 🦄 🌈 ). I'm sure you can guess what my purchase was. 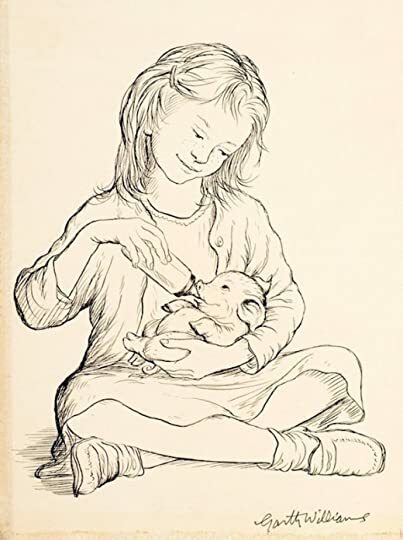 My copy of Charlotte's Web was read more times than I could ever possibly keep track, and as some of my book friends know, even at age 6, I worked hard to keep that well-loved book in pristine condition. 😉 We still have my copy somewhere, and I'm on a mission to find it. All of that to say, when Audible had a sale recently on the audio read by E.B. White in the 1970s, I quickly bought it. You know an audio is good when you are instantly ready to listen to it again. There is nothing better than the author of THE perfect book reading his own perfect words. So much love and connection in his voice, tone, and inflection. Some books are full of magic that lives in your heart forever, and Charlotte's Web is certainly in mine. Within 3 minutes of reviewing its Top 100 Novels Written in English List, I knew The Modern Library was irrelevant. That's because it failed to include CHARLOTTE'S WEB. I mean, I realize that children's literature is considered a joke by most intellectuals, but get serious. Anybody who reads this story and fails to recognize its greatness doesn't really like books, in my opinion. Not only does CHARLOTTE'S WEB feature one of the most ingenious plots in all of literature, its prose is breathtaking. Within 3 minutes of reviewing its Top 100 Novels Written in English List, I knew The Modern Library was irrelevant. That's because it failed to include CHARLOTTE'S WEB. I mean, I realize that children's literature is considered a joke by most intellectuals, but get serious. Anybody who reads this story and fails to recognize its greatness doesn't really like books, in my opinion. "The autumn days grew shorter, Lurvy brought the squashes and pumpkins in from the garden and piled them on the barn floor, where they wouldn't get nipped on frosty nights. The maples and birches turned bright colors and the wind shook them and they dropped their leaves one by one to the ground. Under the wild apple trees in the pasture, the little red apples lay thick on the ground, and the sheep gnawed them and the geese gnawed them and foxes came in the night and sniffed them. One evening, just before Christmas, snow began falling. It covered the house and barn and fields and woods. Wilbur had never seen snow before." I mean, what could be more evocative or sensual? And the fact that White does this in such simple language only underscores his reputation as a great writer. It may sound weird but this is the first time I am reading this book. I don’t know how I missed out on it when I was a kid. Maybe it was the Famous 5 or Hardy Boys or Nancy Drew. Anyway, if I had read it as a kid I might have mustered some sympathy for Wilbur. Right now though, I am just mad. Such a whinny and annoying crybaby. Met enough people like him in real life. 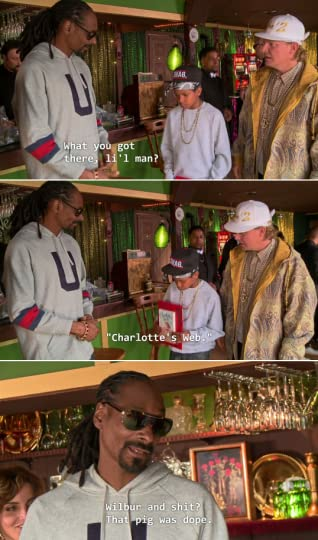 Poor Charlotte! My personnel bitchy nature aside, this book was amazing. A quick read, but it makes an impact. Beautiful lessons It may sound weird but this is the first time I am reading this book. I don’t know how I missed out on it when I was a kid. Maybe it was the Famous 5 or Hardy Boys or Nancy Drew. Anyway, if I had read it as a kid I might have mustered some sympathy for Wilbur. Right now though, I am just mad. Such a whinny and annoying crybaby. Met enough people like him in real life. Poor Charlotte! At least Wilbur got that right! GO CHARLOTTE! I could not stop myself from crying. I literally had tears in my eyes after I finished reading it. Charlotte was such a sweetheart. And Wilbur's innocence made him look cuter. These lines made me breakdown : "She was in a class by herself. It is not often that someone comes along who is a true friend and a good writer. Charlotte was both." One of the best stories of friendship I have ever read. I watched the movie today and it is one of the best movies ever made. I cried like a ba I could not stop myself from crying. I literally had tears in my eyes after I finished reading it. Charlotte was such a sweetheart. And Wilbur's innocence made him look cuter. Saw the movie adaptation of this classic children's book a decade ago so I'm already familiar with the story. What I like about this book is how it reminds everyone about friendship, compassion, humility, courage, respect, gratitude; and even the concept of life and death was tackled. Young and adult readers will definitely appreciate and enjoy reading this. If you have time to read this one of a kind story, I highly recommend to squeeze it to your reading list. It took me almost one year to realize that I have loved this book all along. I was 10 almost 11 the summer I first read Charlotte's Web. Understanding life and death, the cycle of life, is never an easy experience. Since very little we hear about death and we learn about people and things being born, the two extremes of that cycle. But learning is not understanding. Later, we perhaps get a baby brother or sister, as it was for me, or the neighbor's cat has kittens and one of those kittens comes to live in our house, to be out four-legged companion. And we start to unders I was 10 almost 11 the summer I first read Charlotte's Web. Later, we perhaps get a baby brother or sister, as it was for me, or the neighbor's cat has kittens and one of those kittens comes to live in our house, to be out four-legged companion. And we start to understand what being born means. And as life goes on, we see plants and insects died, sometimes under the soles of an adult's shoe or even our own. If we are unlucky (or perhaps just not very lucky) a pet of ours would die when we are still very young, giving us a better understanding of what death means. So, understanding life and death is an endeavor that takes wonderful experiences and terrible experiences, and that is what Charlotte's Web is all about. One morning over breakfast, Fern sees her father heading outside, ax in hand, and asks an innocent question: “Where’s Papa going with that ax?” The answer is simple: He's going to kill the runt pig of the newest litter. 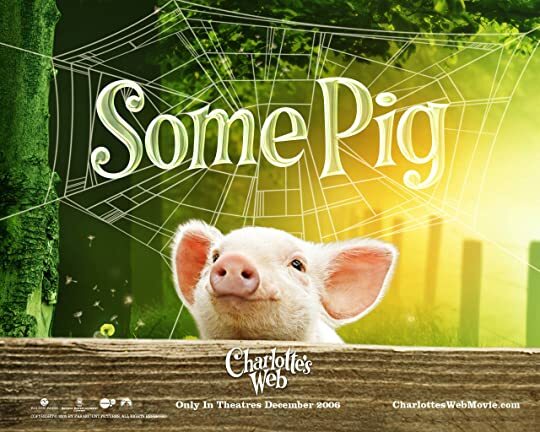 Fern begs his father to spare the little piglet and she nurses him into a healthy pig, but it's Charlotte, the pretty but rather large and hairy spider living over Wilbur's nook, who really saves Wilbur's life, using words she weaves in her web. The words she uses describe how extraordinary Wilbur is. This ensures that everyone believes he really is an extraordinary pig, and consequently he becomes famous. He is not like any other pig and, therefore, will never share their fate. This is a book I've liked since the first time I read it, but that has much to offer to readers that are not children. It's a book that treats some of the hardest events of our lives with love and respect, helping us both understand and cope with such events. I read this book three times and my opinion of the book has changed each time. The importance of this? Just think how complex and well written a book is if you can take different meanings from a novel at different stages of your life. 4th Grade: Poor piggy! I'm glad he found a nice spider friend. I'm so sad that Charlotte died at the end! But I still hate spiders. 8th Grade: I guess it is a really good outlook on growing up... I didn't I read this book three times and my opinion of the book has changed each time. The importance of this? Just think how complex and well written a book is if you can take different meanings from a novel at different stages of your life. 8th Grade: I guess it is a really good outlook on growing up... I didn't realize until now how Fern spends less and less time with Wilbur as she grows older until now. 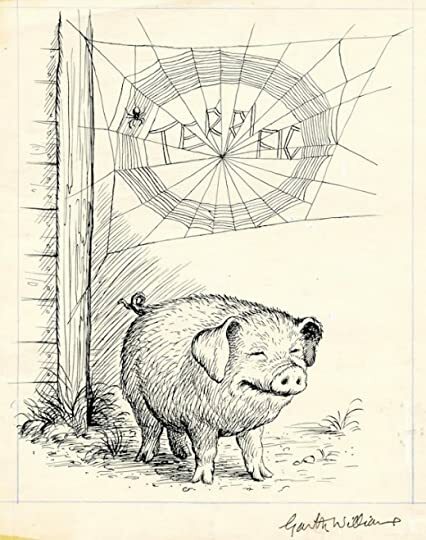 This was one of my favorite books as a kid and I always felt bad for Charlotte that people saw the spider web that said "some pig" and were instantly impressed with the pig... not the super intelligent spider who could spell. Anyways, I had a weird love for Templeton the rat and still think this entire story is absolutely adorable! I distinctly remember my grade one teacher, Doris Wright, reading Charlotte’s Web to us, a chapter or two per day. I suspect there was some snivelling when we reached the end of the tale. Boy, could I identify with the main human character, Fern. 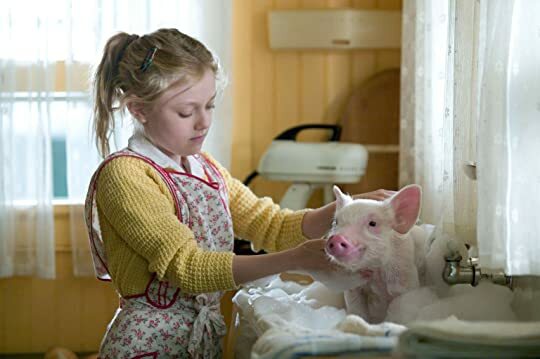 I grew up on a small farm like the ones in the book (without the work horses—we used tractors during my childhood) and it was primarily a hog farm. I was very familiar with how sweet baby pigs are. In fact, when children came to visit, my mom would assemble her camera and some old towels and we would head to the pig barn. She would scoop up a piglet in a towel, hand it to a child, and photograph the proceedings. That cute little round snout on a piglet is irresistible to a child—we have many photos of kids kissing piglets right on the snout! Mostly, however, we didn’t spend much time getting to know the pigs—they would be leaving after they were weaned, sold on to farmers who would raise them to market weight. Not a good idea to get too attached. I also had a spider phobia as a child (which has thankfully subsided as I’ve aged) and I do remember Charlotte being an example that I told myself about, trying to convince myself that spiders were not the horrible creatures that I had imagined them to be. Like Fern, I spend many happy hours in the barn, watching chickens, pigs, cows and horses. In fact, when I was about 3, my uncle gave me some duck eggs and a Bantam hen to incubate them. She hatched four ducklings from the eggs (and was quite distressed when her charges went swimming in mud puddles) and those ducks lived for many years! They would stand and quack at us when we were playing baseball if they wanted to cross the yard for some reason. When we paused the game, the ducks would quickly waddle across, as if they didn’t want to hold up play for very long. Farms have changed so much! Not just horses being replaced by tractors, but the mixed use family farm being lost in favour of large, single purpose farms. Wheat farms, chicken farms, intensive hog farms, cattle feed lots, etc. Fewer children learn to milk cows, gather eggs, and weed gardens. I feel like mine was an idyllic childhood and I’m so glad I grew up when I did. 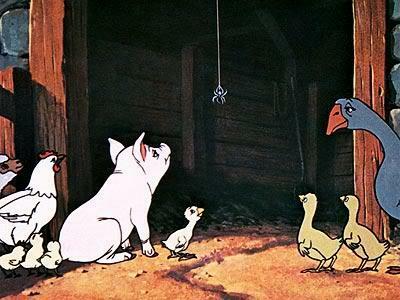 Charlotte’s Web was a great exercise in nostalgia for me, remembering all those wonderful childhood details. Friendship, love, honesty, helping hands, utilizing your talent for a greater good, never giving up, keeping hopes high, embrace what life throws at you because in the end, things are going to be wonderful and if they not, then the ending is yet to come. 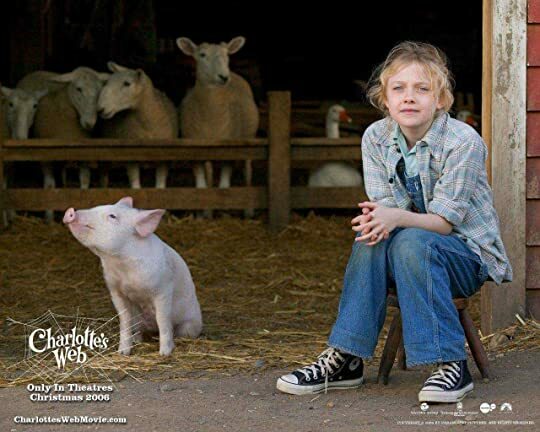 I loved Charlotte's Web very much. I recommend it to people of each age group.